Mike Konczal did some more great work earlier this week in two posts on the not-so-exciting topic of second liens. I don’t have much in the way of new insight or analysis to provide, so let me just summarize. A second lien is a second mortgage on a house. The second lien is junior to the first mortgage, meaning that if the borrower defaults and the first lender forecloses, the proceeds from the sale go to pay off the first mortgage; the second lien only gets paid back if the sale proceeds exceed the amount due on the first mortgage. You can see where this is heading. Konczal’s first point was that in the stress tests almost a year ago, the big four banks held $477 billion of second liens and estimated that these assets were worth 81-87 cents on the dollar, so they would take $68 billion in losses (under the “more adverse” scenario). Konczal estimated that they were instead worth 40-60 cents on the dollar, implying $191-286 billion in losses. So, looking down the chart, the problem seems obvious: the second liens are not worth very much, so the big banks are sitting on major unrealized losses. What’s more, these second lienholders are blocking the principal writedowns that would make sense if there were only one lender involved (a single lender would often rather lower the principal and keep the borrower in the house making payments than foreclose), because those writedowns would wipe them out; but they don’t want to foreclose, either, because that would also wipe them out. So instead we get “extend and pretend,” and possibly servicers pressuring borrowers to pay off their second liens before their first liens. Banks have to write down loans that are delinquent for six months, and we haven’t been seeing this in bulk. As for 3, what we care about is not the number of second liens that are underwater, but the dollar amount. If a HELOC is small and hence easy to pay off, by the same token it is relatively insignificant to the question at hand. More importantly, as Konczal says in a comment to his second post, citing Amherst Securities: “many borrowers are not paying their 2nd, but most of those are unpaid 2nds are home equity lines of credit. The unpaid interest is simply added to the balance, and the loan technically remains current.” So the default rate on HELOCs is artificially low. This entry was posted in Commentary and tagged housing, mortgages. Bookmark the permalink. But the banks are unlikely to take action until they get new accounting guidance from regulators that would ease the impact of such significant principal reductions on their capitalization ratios, sources with knowledge of the situation told Debtwire. Can anyone point to a complete CV for Mr. Konczal? He was working as a nebulous “financial engineer” for an unnamed telecom company, and then “independent” blogger, and now sits on a catbird seat at the venerable George Tsooris Roosevelt Institute. But… what’s his real story? Most 2nds are full recourse so they may have some value beyond the underlaying assets. Sorry, have to post this here… this is too much. I’ve read this also. Wouldn’t that result in an odd situation where seconds become more valuable if the first is foreclosed as the cash flow position of the borrower should notably improve? The guy with the first only has the house and once it is gone the debtor can afford the second! I guess all those people making payments on seriously underwater mortgages are doing us all a big favor. Goodness knows they are really stupid for doing it. The sad part is they will probably never recover unless they stop, but if they all stop at the same time, the big banks will collapse. What to do? There is a lot of ambiguity in “not worth very much” such that the statement is essesntially meaningless without some quAntitative understanding of the countervailing factors you mention. Wow Uncle — I am impressed. RE: your question, has there been a shift in the balance of power between gov and finance, just on the grapevine as yet, and they are scared? Is it possible Obama is now focusing his will on getting health care through, and then they know he intends to regulate finance? There is a huge story hiding in second mortgages. I have life long friends that are bankers. Two own the big part of their local banking group. My small local bank originated mortgages. It was quite common for them to originate both first and second mortgages. The first until around 2003 almost invariably went to Fannie or Freddie non recourse while the second was full recourse. The theory was that , being a bank, they could buy the loan back from F&F , make good the second and then own both notes. The bankers fretted about losses but felt they had to do the business to stay in business to avoid being taken over by the big bank groups. So, those seconds gone sour are going to heavily bounce back to the originators. Banks that buy seconds obviously preferred the National Association net work of originators as sources. If you get down and dirty about it, the really big banks were forced to buy the now failed national originators to be able to realize better recoveries where they have a lot of camped on second lien loans . It would be very interesting to compare the purchase prices of the big originators to the loan exposures of the big banks that bought the likes of Countrywide and so forth. The acquisition cost might just prove out to be a pittance compared to exposure. In short, the big NA’s were forced to buy the big originator’s for survival themselves. Obviously, second lien originations that are full recourse by National Associations and such will be golden. Even if the bank were seized, the FDIC would have to make good. Second lien originations from loan mills would be another story. A really big player in seconds was Wells Fargo. They bought from sources with reliable backing. I was told some originators had to put up Letters of Credit. Anyone know the extent of back up sourcing for recourse loans. It’s on some bank or guarantor’s head in other words. “But there’s one big thing standing in the way of principal reduction; second lien mortgages, or second mortgages taken out on a property (like secured loans on mortgaged properties in the UK). Normally second lien mortgages rank subordinate to the first mortgage (first lien). In principle, that means if the property is sold or the borrower defaults, the first lien lender is first in line to get the resulting money, followed by the second lien lender. When mortgage modifications like Hamp come into play, that traditional priority order is reversed. The borrower is paying the Hamp-modified (i.e. lower) first lien amount, and the full second lien amount, so the second lien effectively becomes senior to the first. When principal reduction comes into play, the problem becomes even starker. Current rules say that first lien mortgages can’t be written down before the second. “It is one of the big unanswered questions of the housing crisis: Why hasn’t the government pushed harder to include second mortgages in its anti-foreclosure efforts? Take a stressed borrower with a $200,000 first mortgage and a $50,000 second-lien loan, such as a home-equity line of credit. The government’s foreclosure-prevention approach focuses primarily on modifying the first mortgage by, say, reducing the interest rate. But writing down the junior loan would immediately lighten the borrower’s overall debt burden. And this would be fairer since second loans are subordinate to the first mortgage. The Treasury has a program for modifying second mortgages, but bank participation has remained low. So why hasn’t the government leaned on banks, which hold nearly all the junior loans, to write down more of them? … The more likely reason is that writing down a second mortgage is, of course, principal reduction—and the Treasury seems to want to avoid that, presumably because it may spur opportunistic defaults. There are some push come to shove sticking points involving second liens. Generally, the second lien is unenforceable if there is no value to pass to the second lien holder from the property. Simply put, if the realizable value of the secured property covers only the first lien in part or in whole, the second note becomes an unsecured debt. There is literally no existing secured interest. Long before that though, the second lien lender will have forced the recourse issue with the originator. If the originator is a National Association or Federal Reserve Bank Member, the bank will be forced to make good 100 %. If the bank is unable to do so, it is almost by default subject to FDIC, Comptroller or State seizure. In other cases, prudent buyers of second notes from originators will be able to draw on Letters of Credit to make good the failure to repurchase. Here is why Wells Fargo avoided a lot of losses on second notes, I am told. HELOC’s are a different animal.The abuse here is when both the first and second loan are purchase money loans. 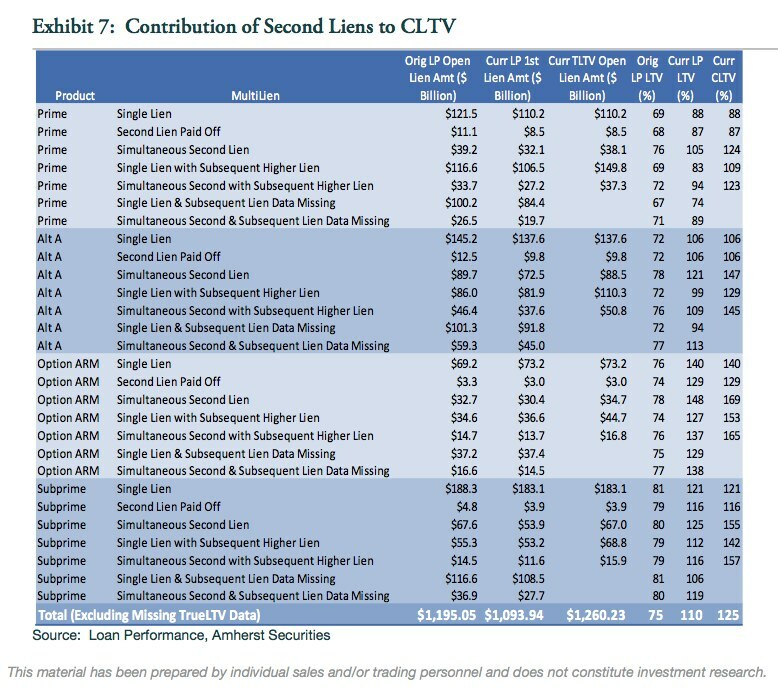 Second Lien loans that were securitized must be in never never land with all kinds of permutations.Second mortgage collectability both direct and by guarantee are not a single issue item. My experience here is as a person that relies on banks to be paid for construction work performed for customers of the banks or to finance real estate syndications. Shenanigan’s abound in bank financing based on several decades of direct exposure to a lot of deals. My end of the deal was involved in getting banks to pay when they try to avoid payment. Actually, the first generally has the right to go against the borrower for a “deficiency judgment” if the sale doesn’t cover the debt. If they do, this may prime the second’s position even if they have full recourse, and most likely, the borrower will end up in bankruptcy anyway (very common) wiping out both potential unperfected interests as unsecured creditors. I believe that most second liens at this point could not be enforced with any reasonable chance of success, and would see their value to lenders, CDO holders, investors, etc, as very close to zero. There will come a time, very soon, when the rest of the subprimes and Alt-A’s default, and then, we got real problems that those secondary interests won’t be able to survive. This is very telling regarding the revision of the bank assets in any new stress test. One could easily argue that, even with new accounting rules, the value of any asset which represents a second mortgage interest is very close to zero. And then there’s the problem of the looming of Alt-A’s and Subprimes which reset this year (many this Spring). Once these reset, there will be an immense glut of foreclosures (I have heard that more than four million will go under), and that will suss out the chaff (car loans, second mortgages, credit card debt, etc.). Get ready for a new major collapse. And that doesn’t even begin to talk about the commercial mortgage market which is failing badly. This is an important point. Even if they are wipede off the property as a lien in foreclosure, the debtor is still responsible for repayment. I suspect the real reason we will never see a forced hand with regard to second liens is that the market will die for second lien lending at the first sign of increased risk of “cram-down” in modifications. So long as there is ability to pay or a chance the property values will increase with time, the second lien lender has “limited value” in the loan and will not voluntarily give up. This could be solved with “silent seconds” done in a cramdown. The principal balance is reduced but a lien is put on the home to be paid off when sold or refinanced in the future. This would greatly assist the stability of the owner occupant. Investors and vacation home seconds can go to the fish.